You probably think I have an obsession with sweet potatoes. I think I might have an obsession with sweet potatoes. I almost didn't include them in the recipe because I'm getting embarrassed with how often I post them. I swear I don't eat them every day. But this recipe isn't about the sweet potatoes. 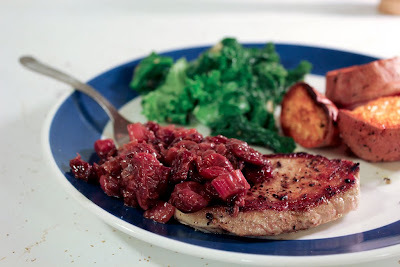 It's about pork chops and delicious chutney, and mustard greens too. It's getting to be warm and spring like and rhubarb is one of those quintessential early spring vegetables, along with asparagus and peas. I might have jumped the gun a bit on rhubarb here - the stuff I found at my grocery store didn't look the best and it was stupid expensive. 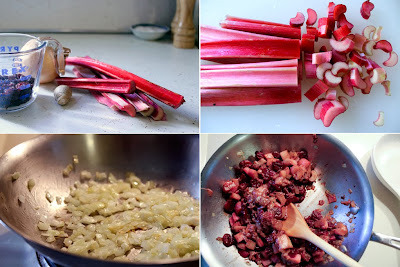 Still, I got it in my head to use rhubarb because I want it to be spring and $6.99 per pound be damned. I had a wonderful, lazy Sunday late afternoon making this dinner. I did all my prepping and took my time with making the chutney and took lots of stress-free pictures. That is, until America's Next Great Restaurant came on. I had tried to time everything so I could watch that stupid show while eating, but it didn't work. So now you know about my dedication to not only Biggest Loser, but another NBC product placement-laden television show. I like food and I like exercising and I like shows that revolve around them. And I don't like waiting until the following day and watching it on my computer. I like to watch it on TV. It's like I'm 65. So mustard greens. Typically kale is my go-to leafy green vegetable. I also really like to make collard greens, and of course spinach... oh and swiss chard. 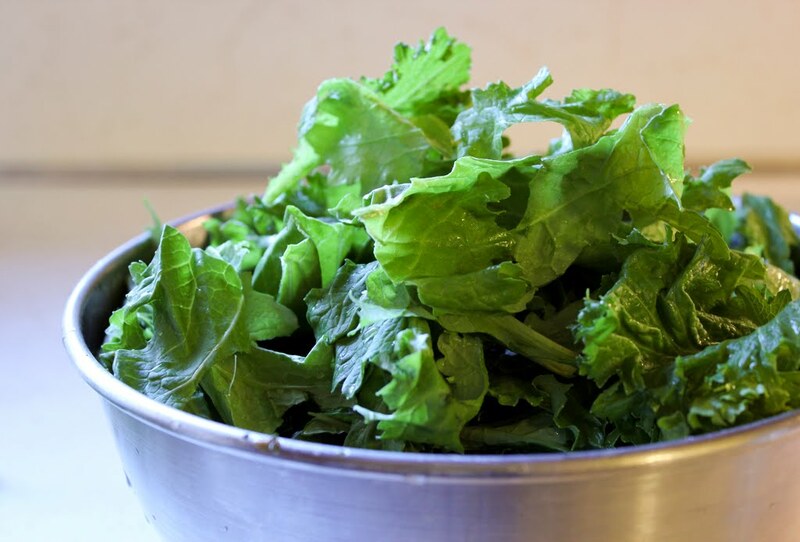 But mustard greens, turnip greens, dandelion greens, beet greens - I kind of forget about them. Which is terrible! They're wonderful! Mustard greens are nice and bitter and spicy. They're great here with a bunch of garlic and generous squeezes of lemon juice. Simple and easy. The chutney here is pretty flexible. 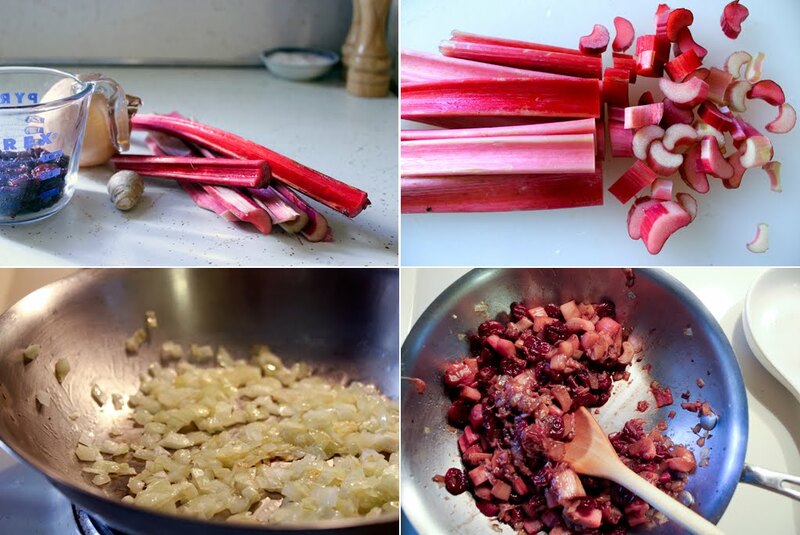 If you don't want to use rhubarb, substitute a granny smith apple. If you don't have cherries but have a bunch of raisins in the pantry, use those. You can use some ground ginger for the fresh stuff. Sherry vinegar for balsamic. You get the idea. 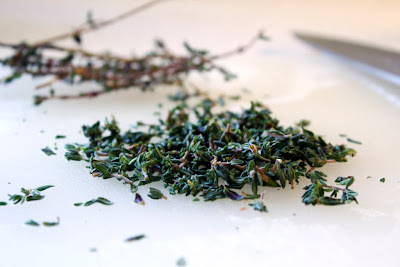 It's just a lightly spiced, vinegared, savory/sweet fruit mixture. Some helpful hints - you can make the chutney first and just set it aside, or far in advance. It should be warm or room temperature when you serve it. The greens can be made while the sweet potatoes are roasting and just covered to keep warm. Cook the pork last and time it so it's finished when the sweet potatoes come out of the oven or thereabouts. 1. In a small bowl, mix the cherries with the vinegar and about 1/4 cup hot water. Let sit for about 10 minutes, until softened. 2. Heat oil in a small pan over medium low heat. Add onions and ginger, and sauté for 10 minutes. 3. Add rhubarb and cherry mixture. Simmer until rhubarb has softened, about 8 minutes. Stir in nutmeg and mustard. 1. Preheat oven to 400 degrees. 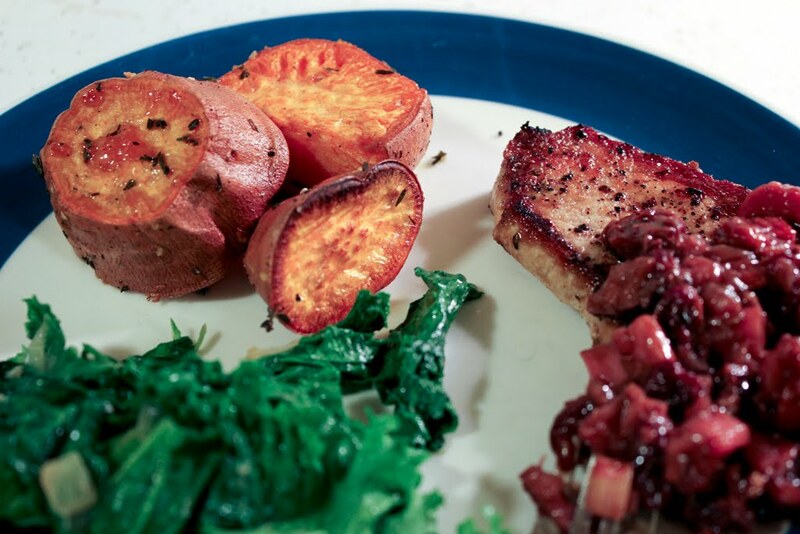 In a large bowl, toss sweet potatoes with remainder of ingredients. I find it helpful to fit the large bowl with a slightly smaller one on top and shake. 2. 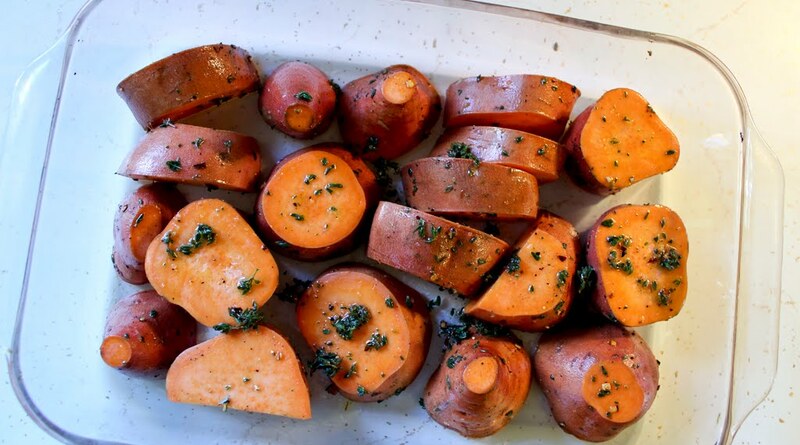 Arrange sweet potatoes in a 9x13 inch Pyrex dish, or rimmed baking sheet. Roast until tender and browned, about 60 minutes. 1. 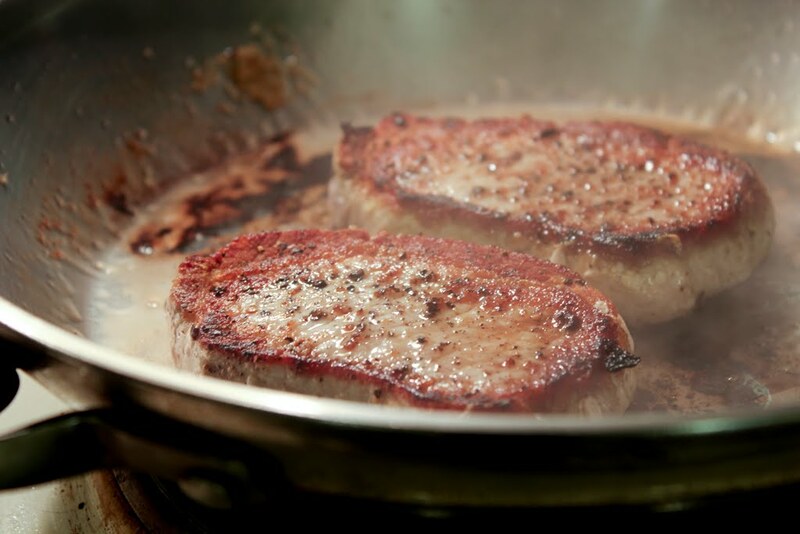 In a large, heavy sauté pan, heat butter over medium-high heat. Add onion and sauté until translucent and beginning to brown, about 6 minutes. Add garlic and sauté for about 2 minutes more, making sure garlic doesn't burn. 2. 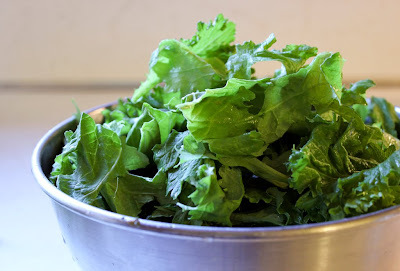 Add mustard greens in stages, adding the next amount after the first has wilted and made room in the pan. Once all greens are wilted, remove from heat and toss with lemon juice. 1. Generously season pork chops with salt and pepper. 2. Heat oil in a heavy skillet over medium-high heat. 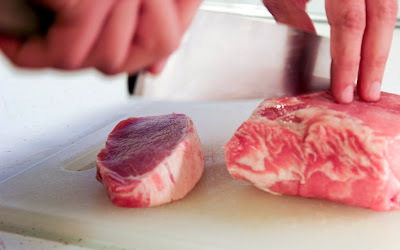 Add pork chops, doing it in stages if necessary to avoid crowding. 3. Cook chops for about 5 minutes per side, depending on thickness. Internal thermometer should read 155 degrees. Serve the pork chops with a big spoonful of chutney on top and then put some greens and sweet potato on the side. Delicious!